Zinc and vitamin C contribute to the normal functioning of the immune system. 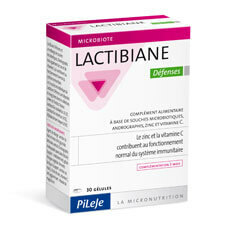 Lactibiane Défenses is a blend of microbiotic strains, andrographis (an herb of Asian origin), as well as zinc and vitamin C, which contribute to the normal functioning of the immune system. Microbiotic strains in Lactibiane Défenses selectively bred by PiLeJe are registered in the National Collection of Microorganism Cultures (CNCM). 1 capsule daily for 10 days in a month. 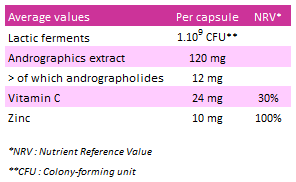 Swallow capsules before meals. Not suitable for pregnant or breastfeeding women and children under 12 years of age. Repeat the course after several months. Do not exceed the recommended daily dose. Keep out of reach of children. This food supplement is not a substitute for diverse balanced nutrition and a healthy lifestyle. Buking agent: corn starch and glyceryl mono-, di- and tribehenate, Andrographis paniculata andrographis extract (leaves) (carrier: maltodextrin, capsule of plant origin, lactic ferments (carrier: corn starch), zinc citrate, vitamin C, anticaking agents: magnesium stearate.